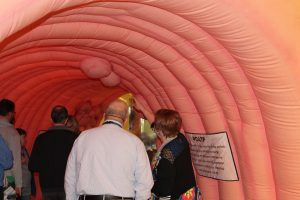 Visitors explore the inflatable colon at the Strollin' Colon Cancer Awareness event held on March 16, 2017, at Mayo Clinic's campus in Rochester, Minnesota. Colon cancer is the fourth most common form of cancer diagnosis in America. However, it is very treatable when caught in early stages. Throughout the month of March, Mayo Clinic is enlisting the help of a giant inflatable colon to help patients learn firsthand how colon cancer develops and the key role that screening plays in prevention and early detection of cancer when treatment is most effective. The Strollin’ Colon made its appearance on Mayo Clinic's campus in Rochester, Minnesota earlier this month. 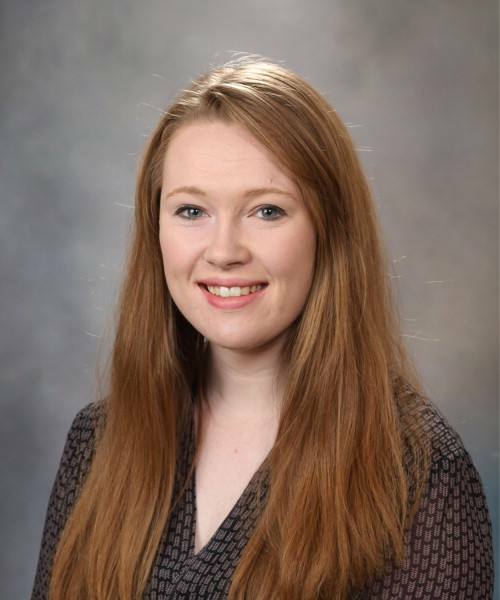 The event was co-sponsored by Mayo Clinic Center for Individualized Medicine and Mayo Clinic Cancer Education Program and highlighted the latest developments related to colon cancer – the second leading cause of cancer-related deaths. Three experts presented an overview of current treatments and exciting research underway to improve screening and prevention and develop more targeted, personalized treatments based on an individual’s biological and genetic characteristics. Nicholas Chia, Ph.D., associate director, Center for Individualized Medicine Microbiome Program, discussed his research, which focuses on unlocking the link between colon cancer and the microbiome, the community of bacteria on and inside your body. Dr. Chia is investigating how this “ecosystem of bacteria” impacts colon cancer and whether it can be tapped to develop new screening tools and treatments. Dr. Chia also highlighted the importance of a varied diet and exercise to maintaining a diverse microbiome and improve digestive health. 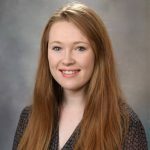 Katherine Agre, M.S., CGC, a genetic counselor in Mayo Clinic’s Department of Clinical Genomics, discussed how genetic counselors help patients understand their own risk and risk for family members for developing inherited colon cancer such as Lynch Syndrome, where a genetic mutation can be passed down through generations of a family and cause colon cancer and sometimes other cancers as well. Counselors also work to identify cases of familial colon cancer, where environmental factors such as lifestyle habits and where people live may contribute to a higher incidence of colon cancer, as compared to the general population. Agre explained that while inherited colon cancer and familial colon cancer only account for five to ten percent of all colon cancer diagnoses, it is important for individual’s to talk with their doctor and a genetic counselor if there is a family history of colon cancer. Genetic testing to diagnose hereditary colon cancer can lead to better screening and earlier treatment. 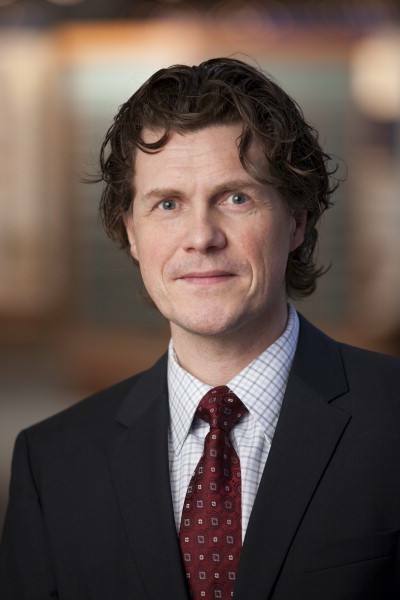 Thorvardur Halfdanarson, M.D., a medical oncologist who specializes in gastrointestinal cancers and consultant in the Division of Medical Oncology, highlighted how better understanding of the biology and genetics behind colon cancer have led to more targeted treatments and better outcomes for colon cancer patients, even those with advanced disease. 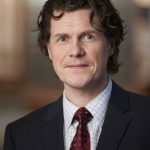 Dr. Halfdanarson also discussed how genetic testing has played a key role in identifying patients with advanced cancer who will benefit from immunotherapy, which are medications that stimulate the body’s immune system to fight the growth of cancer cells. With many clinical trials in all types of colon cancer underway, he expects these trials will lead to new screening tools and more targeted, individualized therapies. To learn more about colon cancer and see the Facebook live presentations from the Strollin’ Colon Cancer Awareness event, visit the Center for Individualized Medicine Facebook page.